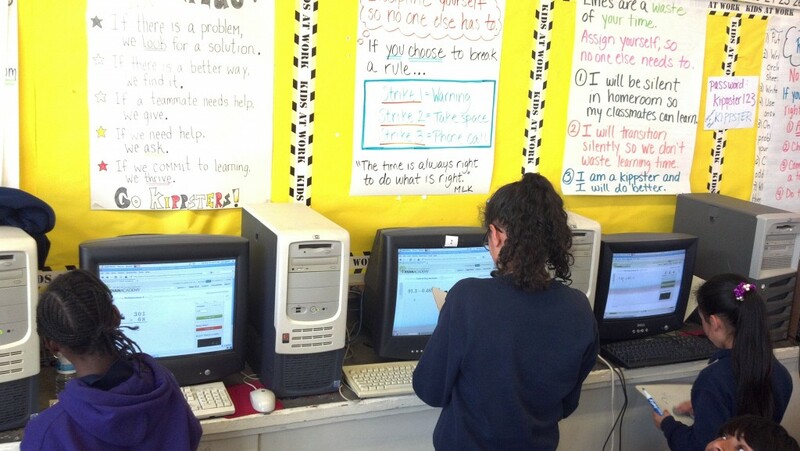 Students at the KIPP San Francisco Bay Academy are also using Google’s Linux Chromebook notebook computers in their classes to access 7th grade social studies and history lessons taught by Jame Sanders. The students use the Linux Chromebooks at their desks to access Mr. Sanders on-line history lessons. You can see his on-line history lessons here. The student have also created their own blogs. An example is here, the blog of Rebecca L. The chromebooks were generously provided by a donation Google obtained by Mr. Sanders directly. Linux computers at the KSFBA have ebbed and flowed. For years, there was a Linux computer lab, which was eventually replaced by a Microsoft Windows lab, due to preferences by an administrator with a fondness for Microsoft Windows and a lack of familiarity with Linux. There has always been a presence of Linux computers at KSFBA, though, and the Partimus volunteers have a special fondness for the KSFBA, because it the first school that we supported with Linux computers. The upcoming 2012-2013 school year should see an increase in Linux computers, both because Mr. Sanders is hoping for more Linux Chromebooks, and because Partimus is hoping to secure more notebook computers to install with Ubuntu Linux. This was written by Christian Einfeldt. Posted on Saturday, June 2, 2012, at 1:06 am. Filed under News. Tagged Khan Academy, kipp. Bookmark the permalink. Follow comments here with the RSS feed. Post a comment or leave a trackback. ‹ 20 new pre-owned notebook computers coming!